Welcome to San Lorenzo Library! The San Lorenzo Public Library offers a wonderful array of materials and services. The Library instills the love of reading and learning starting with preschool storytimes and continues to engage people of all ages and diverse walks of life to build an informed and thriving community.The Library’s friendly staff is always ready to help you find books, movies, music, computer assistance, and more. Come to the Library’s service desk for help with questions of any kind. San Lorenzo Library is the original branch of the Alameda County Library, established in 1910. The current facility opened in 1968. 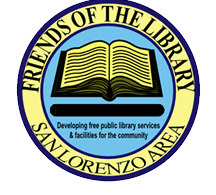 San Lorenzo area residents provide additional support to the library through a Utility Users Tax.